Employees spend a third of their lives at work. ServiceNow is dedicated to making work better for people. As the fastest-growing enterprise cloud software company in the world, ServiceNow transforms old manual ways of working into modern digital workflows so employees and customers get what they need, when they need it. ServiceNow is driven by the belief that when people work better, business works better. 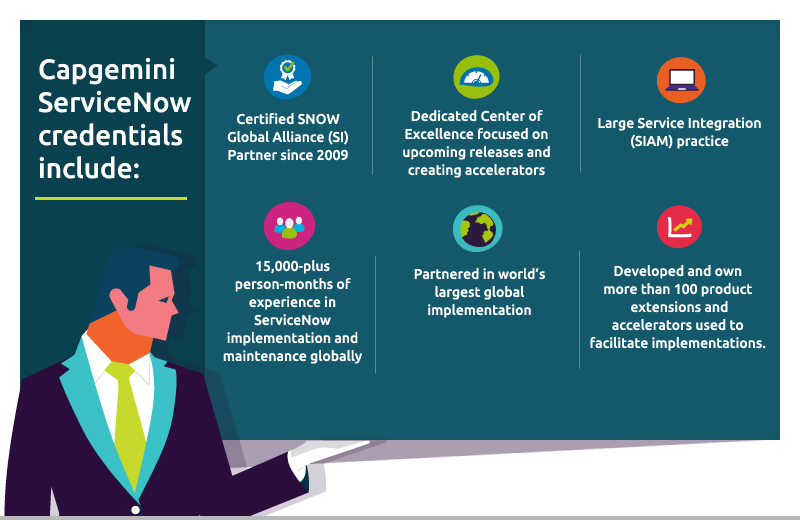 Using the ServiceNow platform, Capgemini offers a complete range of support for IT Service Management transformation to help customers become pioneers on the ServiceNow Lightspeed development platform. The solution extends ServiceNow capabilities so the ITSM platform can actually accelerate the digital transformation strategy rather than get in the way. With more than 400 consultants with process digitalization experience and knowledge from large-scale implementations at Fortune 500 customers, Capgemini and ServiceNow deliver digital workflows that create great experiences and unlock productivity. Learn how Capgemini and ServiceNow can improve workflow and accelerate your digital transformation.